REFURBISHED PRODUCT: Quality checked and full functional. Original packaging. The packaging can be damaged. Product information "REFURBISHED E-GO 2 E-Board, Hot Pink (EU Version)"
Quality checked and full functional. Original packaging. The packaging can be damaged. Everything you need is wireless and right in your hand. Accelerate or apply the brakes easily with the slide of a knob on the E-GO2's Bluetooth remote controller. You have the choice between two preset acceleration levels and the integrated LEDs, and the built-in vibration alarm constantly tell you how much battery power the board and controller have left. If you don’t want to use the controller, then use your smartphone as a controller by downloading the E-GO app (iOS only). IMPORTANT: Please note that this item can only be delivered to mainland Europe, UK and Ireland for logistical reasons! 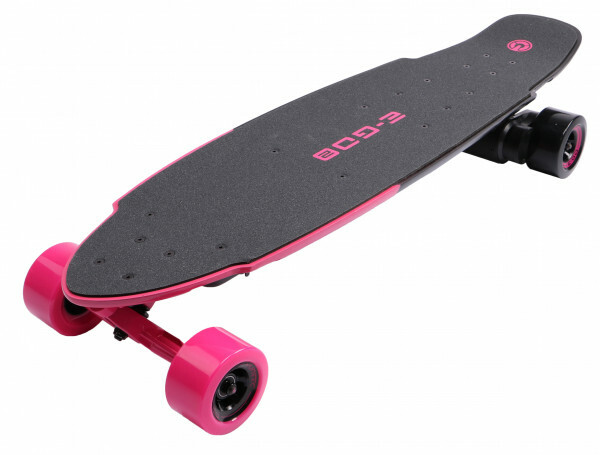 Related Links "REFURBISHED E-GO 2 E-Board, Hot Pink (EU Version)"